In a lot of cases our users face a situation when they don’t have a column of record Ids that must be used to update records or must be specified in the Lookup field to associate records with other records (Lookup or Master-detail fields). XL-Connector has a built in functionality of looking up record Ids based on their names. 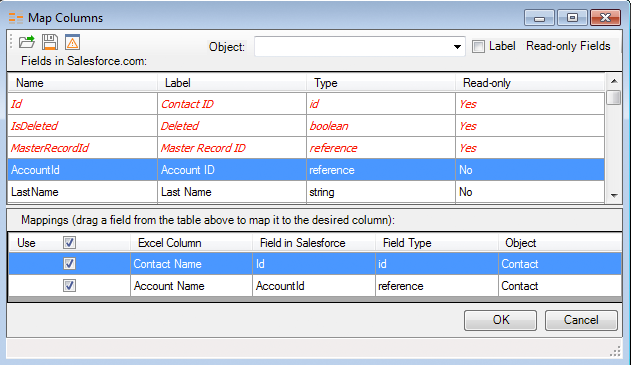 To make this possible, simply map a column of record names to either the Id field on your object or to any relational field (either lookup or master-detail), for example AccountId or OwnerId. With this setup, XL-Connector will know to first lookup the Contact and Account Ids based on the corresponding names, and then use these Ids in the actual Update operation. For reliable operation of the lookup functionality described in this post it is important that there are no duplicate record names in the system. If there are duplicates – the lookup will use the first record it can find with the given name, and it is not guaranteed to be the record the user wants to use.